Customized chocolate bars are a fun and inexpensive way to celebrate Valentine’s Day with friends and family (plus teachers, doctors, hairdressers and anyone else on your list). 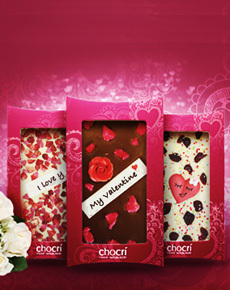 Made by hand to your precise specifications, you can show your chocolatier skills by creating a signature chocolate bar for Valentine’s Day 2011. Or, make each bar with a special touch for the recipient: milk chocolate, almonds and fleur de sel sea salt for Dad; dried cherries and cranberries in dark chocolate for Mom (the “antioxidant bar”). Depending on how many toppings you add, the bars cost from $5.00 to $10.00. The only catch: You’ve got to order by the end of Monday, January 31 to get your chocolate bars in advance of Valentine’s Day. You’ve got the weekend: Start designing!